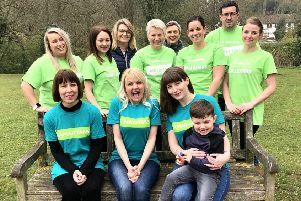 Members of staff at Duncan & Toplis are taking on a different kind of taxing endeavour by losing weight to raise money for The Sick Children’s Trust. Paul Dobbs, Nigel Fannon, Robert Mantle and Jo Norton from the Louth branch have each pledged to lose one and a half stone by December 1, in aid of one of their colleagues whose baby daughter is staying at Sheffield Children’s Hospital. The Sick Children’s Trust have supported her by allowing her to stay in accommodation near her baby, who has remained in hospital for 15 weeks since her birth and is still there. Initially she was cared for at Grimsby Special Care Baby Unit before being transferred to Sheffield when she was just seven days old, which means a three-hour round trip for her parents. Together, the colleagues hope to raise at least £500 for the charity. Nigel Fannon added: “Having an office job makes it very easy to gradually put on weight without realising it. I therefore made a promise to myself earlier this year to do something about it, and this was the push that I needed. So far, since August 1, the total money pledged has already reached £232.50 – nearly half of their goal.